Memorial Day in D.C. - Visiting the War Memorials ~ Learn, Live, and Explore! 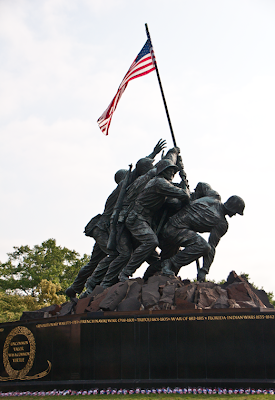 Washington D.C. is a perfect city to be on Memorial Day when you want to honor the veterans who fought for our country. A few days before the holiday weekend, members of the U.S. 3rd Infantry Regiment, also known as The Old Guard, perform the "flags-in" annual ceremony at Arlington National Cemetery, where one flag is planted in front of each grave marker - a ritual that has been performed for the past 40 years. 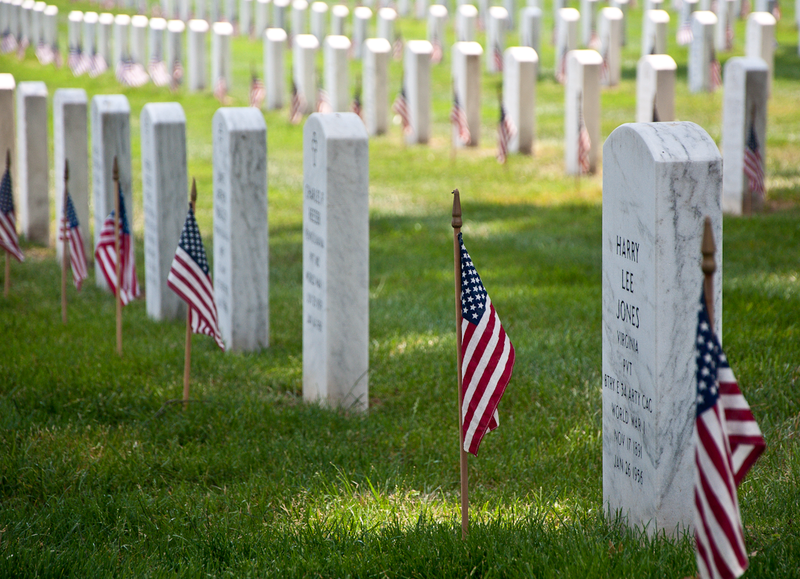 Whether it's Memorial Day, Veterans Day, or any day, Arlington Cemetery is a popular destination for locals and tourists alike. The history of the land is very interesting and dates back to George Washington. The land and the Arlington House mansion that remains atop the hill today once belonged to George Washington Parke Custis, grandson of Martha Washington and step-grandson of George Washington. The name "Arlington" was selected because it was the name of the Custis family ancestral estate in the Virginia tidewater area. Upon George Custis' death, ownership of the home transferred to his only child, Mary Anna Randolph Custis, who in June 1831 had married her childhood friend and Alexandria native, Robert E. Lee. It was in this house in 1961 that Lee made the difficult decision to resign his commission with the U.S. Army when his home state, Virginia, decided to secede from the Union and join the Confederacy. The desk Lee used to pen his resignation letter remains in Arlington House. During the Civil War, the land was immediately seized by the Union Army. Later, ownership was declared by the government due to unpaid property taxes, and the estate was sold to a tax commissioner for government use. In 1864, as the dead from the Civil War was rapidly growing, a need arose for additional burial plots. 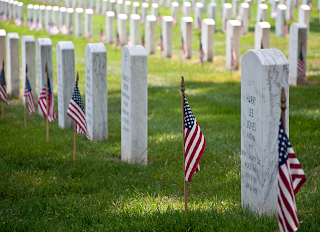 On the grounds of the Arlington House estate, Arlington National Cemetery was established. After a 12-year legal battle, George Washington Custis Lee, son of Robert E. and Mary, received a favorable U.S. Supreme Court ruling that returned the property to the Custis Lee family because it was confiscated without due process. At this point, the property was uninhabitable, so the Lee family finally received compensation for their loss when they sold the property to the U.S. Congress for $150,000. The Arlington House has been restored and is available for tours. 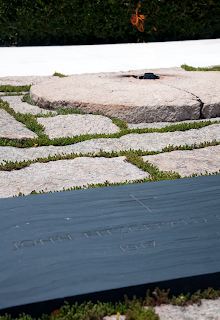 Just down the hill from the mansion is the popular grave site of the Kennedy Family: John F. Kennedy with the Eternal Flame behind him, Jacqueline Kennedy Onassis, and two of their children - Patrick, who died early in his infancy and a stillborn girl. 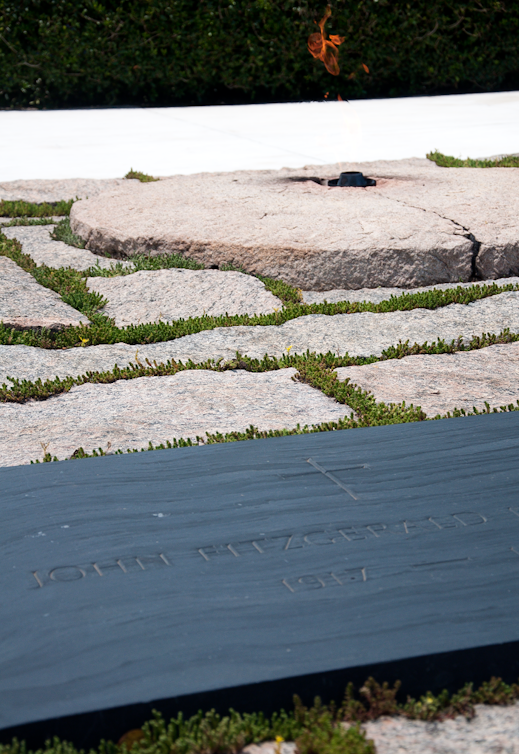 Located nearby are the graves of his two brothers - Senators Robert F. Kennedy and Edward (Ted) Kennedy. As part of the Kennedy memorial, several quotes from his famous Inaugural Address are etched in a long stretch of granite. Another popular area within the cemetery is the Tomb of the Unknown Soldier. Guarded 24 hours a day by a member of The Old Guard, this tomb contains the remains of an unidentified soldier from World War I. 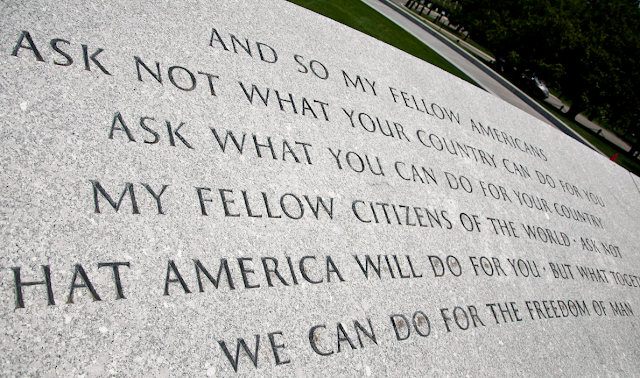 Directly in front of the white marble sarcophagus are three marble slabs for the unknown soldiers of World War II, the Korean War, and Vietnam. 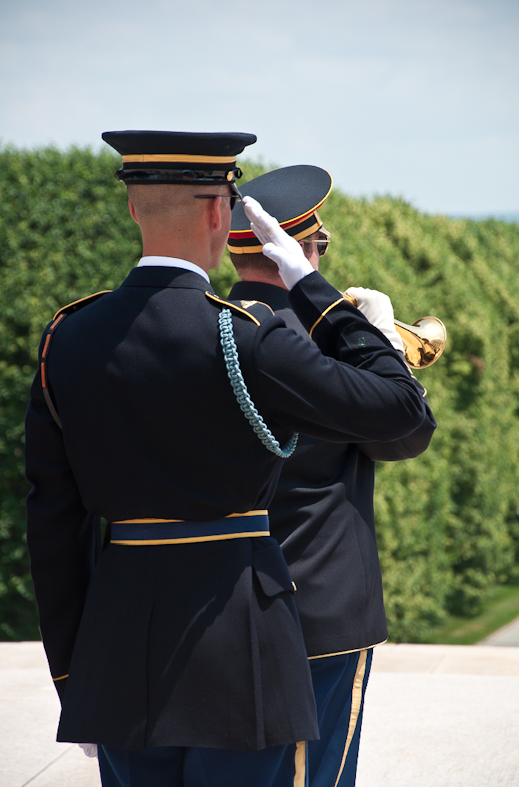 Many tourists spend time at the Tomb of the Unknown because from October-March there is a changing of the guard ritual every hour on the hour, and from April-September it is every half hour. 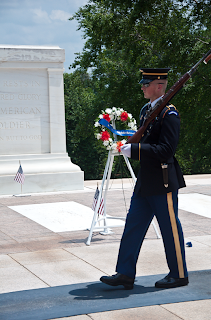 Members of The Old Guard are volunteers and have passed a very rigorous process that includes memorizing and reciting, verbatim, seven pages of Arlington Cemetery history, physical height and proportion restrictions, lengthy interviews, a two week trial, and a training period culminating in a Tomb Guard Identification Badge test. Training, weapon and uniform cleaning, and continued studies of cemetery facts are ongoing activities during their service in The Old Guard. 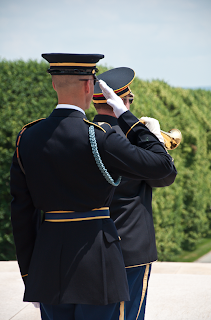 On Memorial Day weekend, it is not uncommon to also see a wreath laying ceremony with a bugler playing taps. 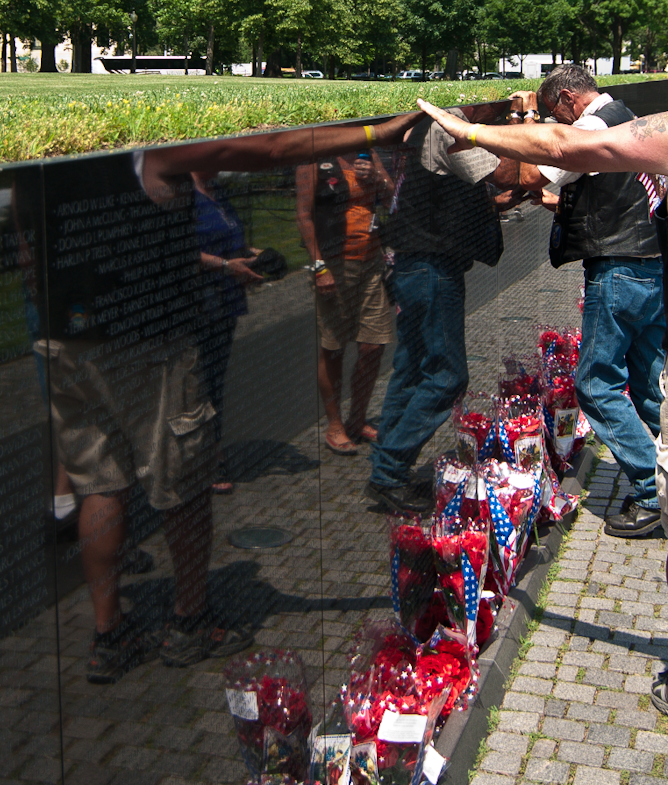 Memorial Day in D.C. also means that it is the annual pilgrimage to our Nation's capitol of Harley-Davidson motorcycle riders, called "Rolling Thunder" - hands down the loudest weekend of the year! Many of the riders are Veterans of the more recent wars - Vietnam and the first Gulf War and the two theaters of the War on Terror - so the Vietnam Memorial is a popular destination for these men and their families. The memorial began with controversy when, in 1981, a design contest was held and won by a 21-year old Asian-American student whose concept was to create an opening or a wound in the earth made of polished black gabbro stone to symbolize the great losses of the war. Many opponents of the design believed that instead of a wound, it looked more like a black mark or a scar on our history. These negative opinions, coincidentally, mirrored the polarized sentiments towards the war - then and now. As a compromise, a bronze statue of three infantry soldiers was added to the memorial grounds. My visit to the Vietnam Memorial this year was very sad because I encountered a Veteran of the war, dressed in his motorcycle gear, right as he found his friends' and fellow soldiers' names on the wall and started sobbing, slowly dropping to one knee, protected by a circle of his family and friends. It was a very touching experience. Fortunately the remaining war memorials in D.C. are not quite as emotional as what I observed at the Vietnam War Memorial. 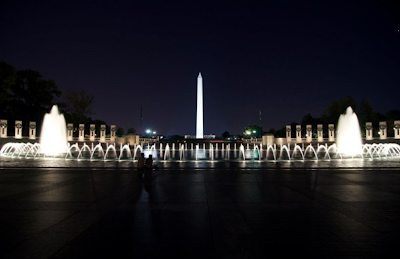 The newest addition to the National Mall is the World War II memorial, dedicated in 2004. Situated directly in between the Lincoln Memorial and the Washington Monument, at the end of the reflecting pool, the design of the memorial is a large fountain flanked by two semi-circles of columns - one for each state, the Commonwealth of the Philippines, Puerto Rico, Guam, American Samoa, and the U.S. Virgin Islands. 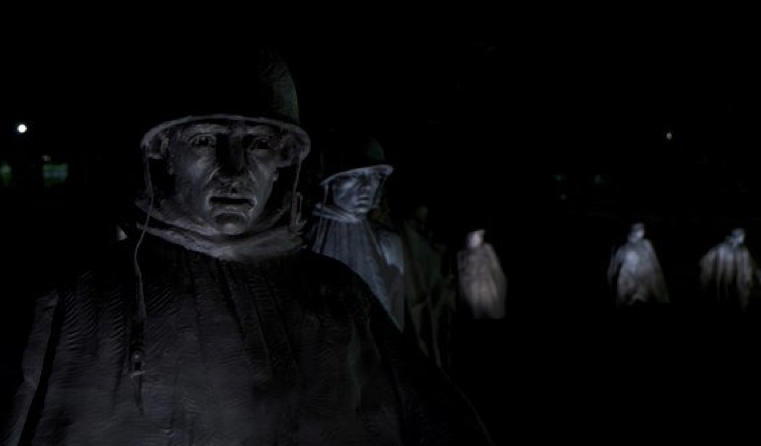 Also in between the Lincoln Memorial and the Washington Monument, south of the reflecting pool, is the Korean War Memorial. 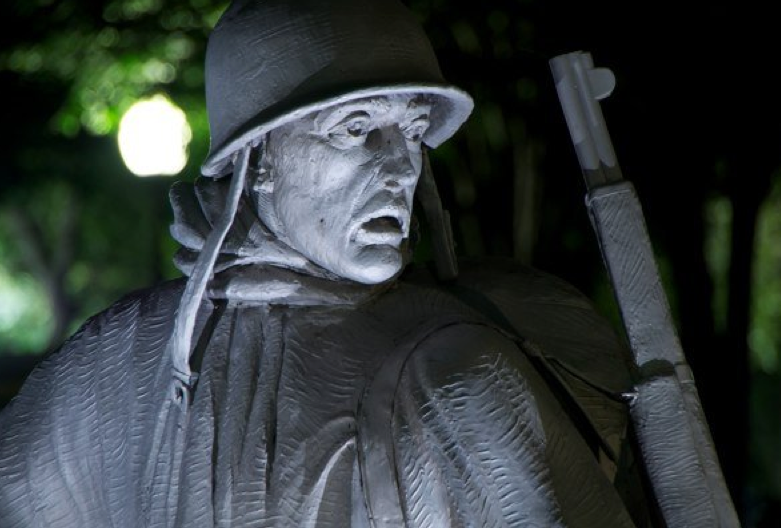 In my opinion, this is my least favorite and the creepiest war memorial in the U.S, if not the world. The 19 stainless steel statues of men on patrol, with their hollowed out eyes, just look haunted - especially at night. 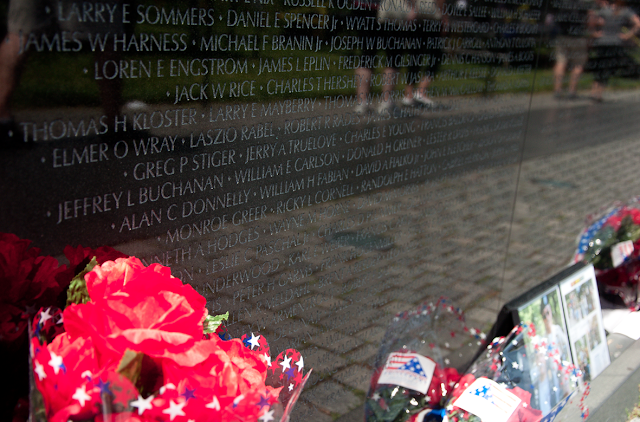 And on the granite reflection wall, the sandblasted photographic faces appear as if they are ghosts of the fallen. 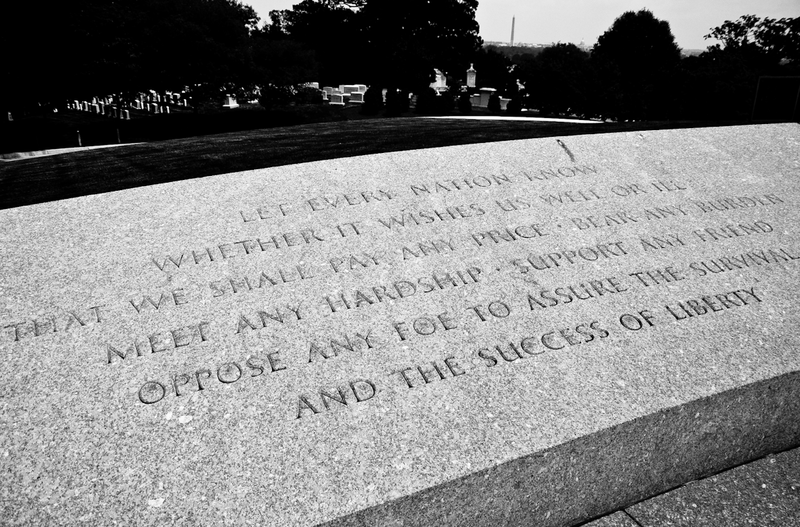 "Let every nation know - whether it wishes us well or ill - that we shall pay any price, bear any burden, meet any hardship, support any friend, oppose any foe to assure the survival and the success of liberty." So cool julie! Wish i was in DC this weekend...proud pappa romano did the vietnam sidewalk!